Panic was beginning to set in. Mattingly had made his annual speech bashing the team's effort and lack of concern. Adrian Gonzalez was quoted about questioning if the club had a comeback in them and a few players reiterated that the amazing run of 2013 (forty-two wins in fifty games) was historic and might never likely be repeated. Matt Kemp stated that gaining one game a week in the standings would suffice allowing the Dodgers to catch up. Three weeks later, that one game gained per week has turned out to be a little more than three. The .840 winning percentage clip from 2013 will not be matched, but a .684 run in the last three weeks has been very respectable. There are those that will say that the Giants are tanking it and handing the season to the Dodgers. Maybe so, but there was no way they were going to continue playing near .700 ball all season and good teams don't panic. This team hasn't done that and though they aren't world beaters yet, they are playing good ball. Good teams capitalize on opportunities, and when the Giants started to fizzle, the Dodgers stepped up. The Giant's June swoon isn't of epic proportions, (now 5-14 over the past three weeks), but it's notable. And truth is, it won't continue, but a slump of some magnitude was bound to happen to them. Good teams play well on the road. The home record always seems to eventually be well above .500 for them, but the true test is on the road. This Dodger team was playing well on the road from the get go, and that has continued. In fact, the Dodgers 26-16 road record is the best in the National League and only a half game behind Oakland for the best in the majors. Once they squared things at Dodger Stadium, it was only a matter of time that the Dodgers would be back near the top. 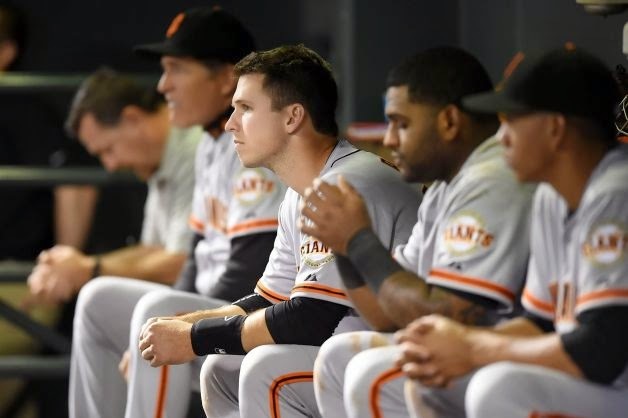 Good teams don't panic, even when they're slumping. When the Dodgers hit rock bottom in early June and it appeared that they might even dip below .500, they knuckled up on the road and just kept winning series after series. And that brings me to my next point. Good teams aren't dependent on long winning streaks. Yes, they help a lot, but churning out series wins and not pushing the panic button after losses are signs of a veteran team. This Dodger club has not put together a winning streak of over three games all season. To fans, this has been rather frustrating. Then again, even after painful losses that would have put them over that 3-game win streak hump (i.e. 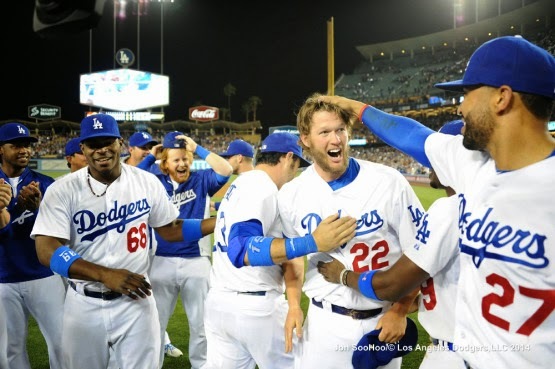 the Jansen blown save in San Diego on June 20th), they have bounced back and continued to win series'. Good teams beat up on their division and the inferior teams. The exception to that rule was probably the 2013 Dodgers who played extremely well outside the Division (55-31, .640), and just below .500 within (37-39). The tables have turned this year, as the Dodgers are taking it to the NL West with a 23-16 record, while going 23-21 against everyone else. Good teams refuse to get buried when some of their star players aren't performing up to par. 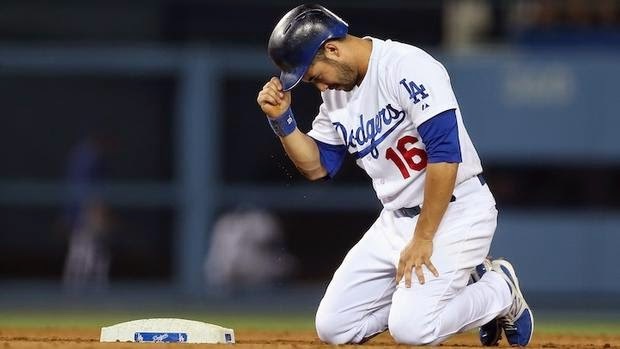 That has been the case with the Dodgers, who have players such as Adrian Gonzalez slumping, and Hanley Ramirez injured. Matt Kemp spent much of this season in the doldrums of a miserable start and Andre Ethier has not played well at all. Combine that with A.J. Ellis' and Carl Crawford's injuries and the recipe for a disastrous season is in place. Yet, contributions from unexpected sources such as Dee Gordon and Justin Turner have kept them afloat. Good teams have solid pitching, and the Dodgers have that. A case can be made for Kershaw, Greinke and Beckett to all make the all star team. Though the bullpen has had its struggles, JP Howell has been lights out. Brandon League has bounced back for the most part and Kenley Jansen is still a closer to be feared, being second in the league in saves. Good teams overcome injuries and don't use them as an excuse for sorry seasons. This team has had their share. Crawford, Uribe, Hanley, Kershaw, Ellis, Kemp, Puig, Wilson, and now we can probably add Turner to that mix. But here they are, within a game of the division lead and plugging holes with the likes of performing players like Rojas, Arruebarrena, Butera, Red Patterson (remember him? ), Figgins, Triunfel, Van Slyke and Turner. Giant fans be wary. This thing has a long way to go, but it's safe to say that this Dodger team hasn't even hit their stride yet. Mark it in your memory banks. June 18, 2014 will go down in history as the greatest pitched game in the history of the team that arguably has had the greatest pitchers in the game. The only way it won't be considered the greatest pitched game ever will be if Kershaw surpasses his own achievement one day. Something I wouldn't put past him either. As amazing as Kershaw's first no-hitter was last night, the efficiency of his use of pitches was as good as I've ever seen a pitcher have. Fifteen strikeouts and only 107 pitches thrown. That is even rarer than a no-htter. In fact, a stat line like that is an absolute recipe for a no-hitter. Kershaw threw 74% of his pitches for strikes. He completed the highest saber metric "game score" in Dodger history at "102." Koufax never exceeded 101, Drysdale's highest was 98. Some great pitchers in baseball history never reached the level of 102 that Kershaw achieved last night. Some of those notables and their corresponding highest game scores were: Nolan Ryan (101), Randy Johnson (100), Bob Gibson (100), Pedro Martinez (98), Roger Clemens (99), Steve Carlton (98), Jim Palmer (93), and Fergie Jenkins (94). So when you read that Kershaw's no-hitter was the greatest pitched game in Dodger history, surpassing Koufax's perfecto in 1965, there won't be any argument from me. Essentially it was a perfect game plus one, because Kershaw had to get 28 outs to complete the feat. Chalking up 15 Ks while throwing only 107 pitches is about as efficient as a pitcher can get while punching out the majority of hitters. You can spell class with a "K" when you consider that Kershaw backed Hanley Ramirez who absolutely botched a throw to cost Kershaw the perfect game. "That was a play that could have easily ruled a hit," said a lying Kershaw who had to know it was about as routine a play that there is. Yes, Ramirez had to hustle on the play, as a fleet footed left handed batter hit that chopper to him, but there was time to make it with an accurate throw. Hanley knew what was at stake and his throw was a panic job. We all know Ramirez isn't much of a defensive shortstop these days, thus explaining why Triunfel was his defensive replacement in the last inning. But in the end, Kershaw shook off the miscue and got down to the business to finishing off the gem. Errors are errors and they can't be controlled. Next start for Kershaw will be Tuesday, June 24 at Kansas City. Mark that date on your calendars because if there was ever a player that could challenge Johnny Vander Meer's feat of two consecutive no-hitters, it is Clayton Kershaw. 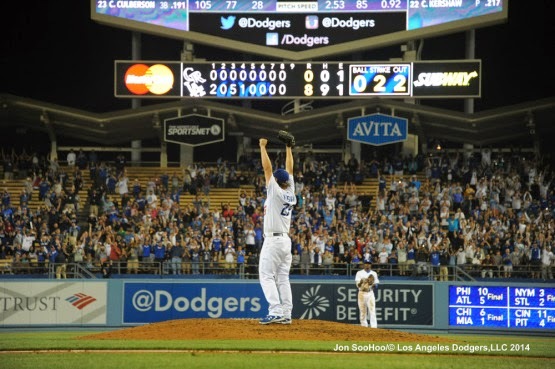 I truly believe that Kershaw is the one pitcher that can throw three or four no-hitters in his career. He has that kind of stuff. It was a very special night for A.J. Ellis too. Catching his first no-hitter, and the one pitched by his best friend. It was touching to hear him say that he was actually tearing up and getting emotional at the end. Ellis is a guy that never was expected to arrive at the level he currently is. His baseball career is that of a true underdog, and here he is, at the pinnacle calling that no-hitter. It is my belief that Ellis will one day be the Dodgers manager. A lot of things will need to fall into place, but I can really see it happening. He has the temperament, patience and baseball knowledge to do so. 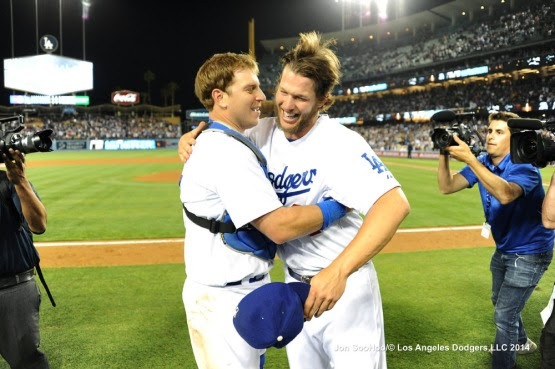 When Kershaw retires from the game and concludes his hall of fame career, it would be appropriate to see A.J. as his manager. You know what the scary art of all this is? Clayton Kershaw is still only 26 years old. We are looking at another 7-8 years of this dominance if he stays healthy. Kershaw throws an assortment of pitches with precision that when his velocity tails off with age, he'll still have a repertoire that few other pitchers possess. 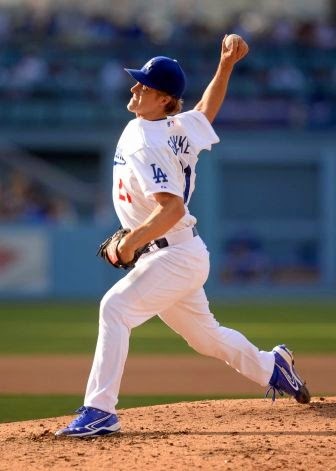 Does Zack Greinke have a no-hitter in him? If he does, the Dodgers would become the first team in history to have three pitchers throw a no-hitter in a season. There is still over 50% of the season remaining. I'd say they have a realistic chance. Not that anyone hasn't noticed, but the Dodgers are now just 4 games back. Two years ago I submitted the following post commemorating Cleveland's promotional "10 Cent Beer Night." It has come to my attention that yesterday was the 40 year anniversary of that fiasco. So, I repost that piece. Hope you enjoy it. "l went with 2 dollars in my pocket. You do the math." There have been a few promotions that went hay-wire and resulted in forfeits. A few can be tied to flamboyant owner Bill Veeck, such as his "Disco Demolition Night" at old Comisky Park. The Dodgers aren't strangers to them as they forfeited a 1995 contest to the Cardinals on the last "Ball Day" that the club will ever have in history when fans began shelling the field with them after Tommy Lasorda argued a call with Joe West. 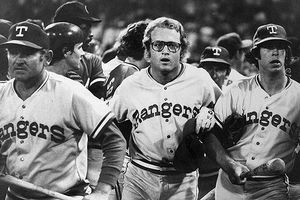 But on June 4, 1974, the Cleveland Indians ninth inning forfeit to the Texas Rangers should have been predicted from the outset. When you essentially give away free alcoholic beverages, I think you're simply asking for trouble. The Tribe in the mid seventies were a sorry crew. Finishing in close to last place almost every year. The Indians often were closest to first place only on opening day each season, (It should be noted that 1974 was an exception though. As late as July 2nd, the Tribe were within 2 games of first place before the wheels fell off). Attendance in 74,000 seat Municipal Stadium was sparse. They played almost every night in that monstrous ballpark to crowds of 4,000 and 5,000. There couldn't be a more difficult job I can imagine than that of being a public relations director for the Indians. It would be quite the chore to invent ways to get fans in the seats. Desperation must have really been in play for the Indians to announce 10 cent beer night at the Stadium. There had to be some sort of forethought with it, but not a lot. That forethought was that a purchaser of beer was limited to six 12 ounce cups per purchase. There wasn't any monitoring of return trips for purchase though. The Tribe hosted Boston the night before when they defeated the Red Sox 4-1 before 4,234 fans. So the Indians P.R. team had to be pleased when 25,000+ arrived to take advantage of the cheap suds for sale accompanied by baseball. The Tribe were accustomed to playing before crowds that filled only 15% of the seats, but this group was active from the start. Some patrons had anticipated the partying festivities and brought in firecrackers that popped off in echoing fashion in numerous parts of the stadium as early as the first inning. By the second frame, a woman had hopped the fence adjacent to the Cleveland dugout and flashed her breasts to the crowd. Making her way to home plate umpire Nestor Chylak for a kiss, she was apprehended and arrested. This was just the start of things. Reports from witnesses at the game claim that a large part of the crowd was made up of under-age drinkers who were the recipients of the suds from the buying patrons on many occasions. When Ranger Tom Grieve homered in the top of the 4th, a teenage streaker made a run for the infield and slid into second base, not something recommended while scampering around in the raw. The next inning a father and son ran around the outfield mooning the crowd and causing a substantial delay before security was able to catch up to the evading hooligans. As the game went on, the antics that many considered "comedy" started to become uglier. Ranger starter Ferguson Jenkins was hit in the chest by a liner back up the box, to which the fans laughed and then began chanting, "hit him again, hit him again, harder, harder." 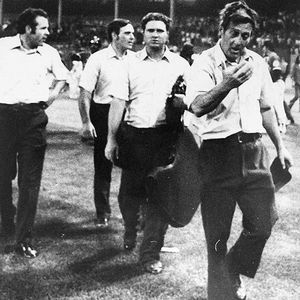 Ranger manager Billy Martin came out to argue a call at third base and was plastered by sloshing cups of beer as he returned to the dugout. When beer started to run out in concessions stands, unhappy patrons became more violent in the stands and started dismantling the rickety seats of the old ballpark. Fights in the stands were constant and there was little if any police presence. Concessions personnel announced to fans that beer was available beyond the outfield walls where their cups were filled directly from Stroh's Beer trucks through hoses attached to spigots. The umpiring crew ordered the bullpens emptied when a fan tossed fire crackers into the Rangers side. These weren't small pop type fireworks of the Chinese New Year variety. They were dangerous cherry bombs and M-80s whose volume in the spacious ball park sounded like hand grenades. The Cleveland Municpal Stadium Security crew was completely overwhelmed. In the eighth inning, a group of thugs entered the field and attempted to remove the padding from the outfield walls. Why? Who knows, but a mob of drunk crazies demanding more beer can do riotous things. The security crew that was picking up litter on the field abandoned that task and went to left field to save the wall. As the P.A. announcer attempted to calm the crowd and stop them from littering the field with debris, it was obvious that all control was lost. Full beer cups, batteries pulled out of transistor radios and eventually concrete chunks and seat parts that were being destroyed in the stands were making their way onto the field through the air. 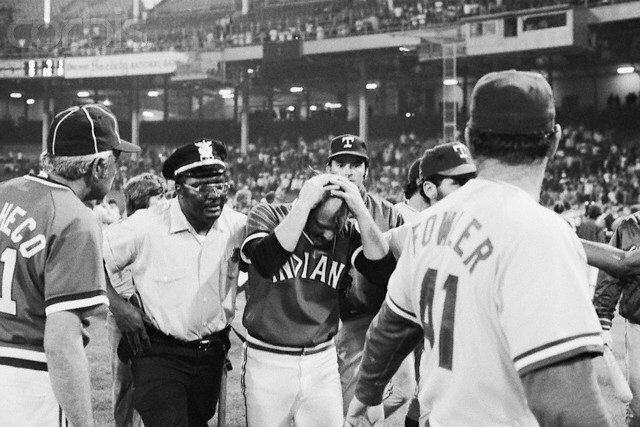 In the ninth inning, the Tribe rallied to tie the game and another fan ran out on the field to right fielder Jeff Burroughs and flipped off his cap from behind. Others say he stole his glove. Whatever it was, Burroughs reacted to go after the fan and tripped in the process. Billy Martin, seeing that his MVP outfielder was down on the ground ordered his players on the field to defend him, lugging bats as protection. "Let's go get 'em boys!" he ordered. It is estimated that Burroughs was surrounded by up to 20 fans that were cornering him to attack when his Rangers teammates came to the rescue. All hell had broken loose and Indians manager Ken Aspromante ordered his players on the field to come to the defense of the Ranger players too. Complete mayhem ensued. Cleveland announcers Herb Score and Joe Tait were at a loss for words describing the action: "This is an absolute tragedy...I've been in the business for over 20 years and I have never seen anything as disgusting as this...I just don't know what to say," reported Tait. There were over 50 players, coaches and umpires battling it out with fans and they were way outnumbered. Some estimated that over 200 spectators were now active brawlers on the field fighting. 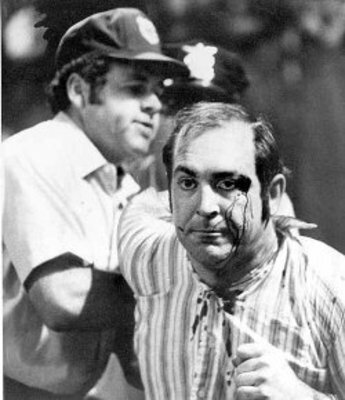 Though many of the players had bats to defend themselves, players are quoted as saying that fans were wielding clubs that were actually arms of dismantled seats, metal seat parts and others had knives. It's a miracle that no one was seriously hurt. "The security people are just totally incapable of handing this crowd," said Tait. "They just---well short of the National Guard, I'm not sure what will handle this crowd right now." The players on both sides retreated to their clubhouses and locked the doors behind them. Reporters that interviewed fans during the melee were assaulted. Nestor Chylak had a bleeding head and arm from concrete chunks and pieces of a seat that that hit him. He called the game when he noticed the blade end of a hunting knife stabbing the turf a few feet from him. It had been thrown from the stands and would have injured or killed him if it had landed a few more feet to the left where he was standing. The Cleveland Police Force Riot squad arrived about 20 minutes after the game and dispersed the crowd. Only nine people were arrested, an absolute joke, which is proof positive that there was virtually no police presence at this game. 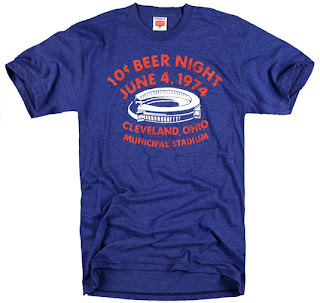 There were 3 more "10 cent Beer nights" planned by Cleveland for other games that year. American League President Lee MacPhail stepped in and stopped that, announcing that all giveaways and promotional nights would require league approval in the future. Thirty eight years later, Ten Cent beer night is remembered as the stupidest promotional event ever introduced in baseball. Yes, even surpassing Disco Demolition Night. It is remembered in this musical ode to that magic night in this You Tube video. Enjoy. If you had told me on April 1st that a little over two months into the season, the Dodgers would have an 18-11 record on the road, I probably would have said they would be way on their way to another NL West title. So here we are, June 4th, and the Dodgers stand at 18-11 on the road, and they're 7 games out of first place for one simple unfathomable reason, THEY CAN"T WIN AT HOME. This is a trend that I keep expecting them to reverse each time they return from a road trip, and they prove me wrong every time. I never thought I'd ever say this, but I actually look forward to their road trips. There are times during the season when a ball club will hit a rough patch at home and a road trip will do them good. Such is the case with the Dodgers at the conclusion of every home stand and this is getting tiring. Here we are, a little over a month away from the All Star break, and the Dodgers are showing no signs of breaking out of this. The teases are there, like that 12 run outburst against Pittsburgh the other day, but then they revert to their old selves and runs can't be scored. When your team sports the NL Player of the month, and you can't cash in...there are problems. When you have stellar pitching performances by Greinke, Beckett, Kershaw and even Haren for a good 3-4 weeks and you lose ground in the standings, well that's a serious problem. When you have a player that can steal bases at the drop of the hat, but you still leave him stranded on the paths, well, the result tends to be losses. The only thing consistent with this team is their inconsistency. I wrote a little over a week ago that a good nine or ten win home stand will turn the season around. I still believe that, but don't see it in these guys. But things can turn, and about 365 days ago we were all saying the same thing about the Dodgers and their inability to string three wins together. Next thing we knew they won 42 out of 50. That was a historic run. So historic that I highly doubt we'll ever see it again. So don't go expecting a 42-8 rescue of the season because it isn't going to happen. Right now I'll take a 6-4 home stand. Heck, even a .500 one would look good at this point.